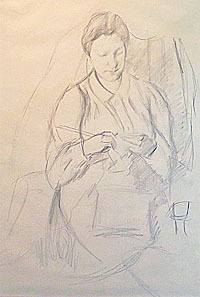 This drawing is by Dorothy Hepworth, the companion of Patricia Preece (Lady Spencer), who was the second wife of the British artist Stanley Spencer, and lived with Hepworth for most of her life. They met when both were students of Roger Fry at the Slade School in 1917, and shortly thereafter set up in a studio on Gower Street in London. They spent some time in Paris studying with André Lhôte, then returned to England where Hepworth’s family provided a cottage for them, Moor Hatch, at Cookham, where Preece became acquainted with Spencer. The story of Preece’s stormy relationship with Spencer is told in much detail in Pople’s biography (Stanley Spencer, HarperCollins, London, 1996). Preece/Hepworth’s paintings were shown at the Reid and Lefevre Gallery in London in 1936, with a catalogue introduction written by Duncan Grant. Another show of their work, again under only Preece’s name, was arranged at the Leger Galleries in London in 1938 with a catalogue prepared by Clive Bell.